Born and raised in Silicon Valley, T. Lynne Tolles is a stay-at-home mom, part-time bookkeeper and writer. In the summer of 2009 she claims she got a 'wild hair' and sat down in front of her computer and wrote "Blood of a Werewolf'" in three weeks. She started "Blood Moon" and "Blood Lust" back to back, the following week. "It was never my intention to become a writer, but the more I wrote, the more addicted I became." The Blood Series books presently include three titles. The "Bloodstone Heart" was released in August 2010 and Deadman's Blood, the final book in the series was released in June 2011. 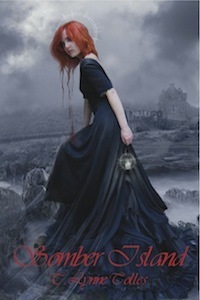 Darby O’Rielly, our heroine, is an inexperienced, sheltered young woman who is a witch by heritage. In an attempt to fit in, the O’Rielly family did not practice their craft or teach their children their magic. Never having used witchcraft, Darby is thrown into a world of magic and supernatural beings when she meets a mysterious dark stranger with a secret. Devon, is our vampire hero, who is instantly enthralled by our heroine. He and his brother, Blake, are not the stereotypical vampires, by any means. When the thugs of a villain from Blake and Devon’s past, show up in an attempt to kill them, Darby is thrown into an emotional upheaval and magically saves the day – by accident. With this new found power, Blake, helps her hone her abilities and try new things. Rowan, Darby’s little sister, has dabbled more in the craft than Darby and when the four try to unravel the mystery that has been laid in their lap, it is she who summons Blake and Devon’s vampire father from the dead, for some possible answers and motive behind our villian. Soon after which, Rowan is kidnapped by more thugs and injected with werewolf blood, turning her into a werewolf for full moons to come. These four solid characters are on roller coaster ride for their lives, dealing with preconceptions, mystery, and the supernatural, bringing them all closer to one another as friends, family and lovers. The interaction between these four, forms the core of this character-driven series. Though Blake Bloomington is on the outs with Rowan O'Rielly and decides to spend some quality time with Dean Wolfe, the werewolf who helped Rowan through her first transformation as a werewolf in 'Blood of a Werewolf'. Blake hopes to learn all he can about werewolves and at the same time win Rowan back. In the interim, a slough of young women in neighboring towns all up and down the coast are mysteriously disappearing. Coincidentally, two stranger's are in town, who are somehow related to the Rowan and Darby O'Rielly's family's witchy past. Are they trying to get a hold of the ancient spell that is hidden in the O'Rielly's Book of Shadows or is there a vendetta to be paid? Mysteries are unravelled and old stories are told while wounds are healed and friends are made. A surprise visit from Blake and Devon's uncle, Dominic, demanding both vampires, come home immediately to find what is ailing his son Anton, puts everyone on edge. Can vampires get sick? Devon doesn't appreciate Dominic's demands, but agrees to fly back to Connecticut with Darby, since Blake has a job to finish up in California. Excited to meet more of Devon's family, Darby is confused by Devon's distance and coldness since Dominic's visit. In Connecticut, this only gets worse when a gorgeous Libby, Anton's estranged wife, shows up unexpectedly and seems to have her sights set on Devon. To top it all off, there's seems to be some pent up animosity, Anton and Devon have towards each other. What is this strange power Libby has over the men in this family? And what's wrong with poor Anton? Why does it seem that Anton and Devon hate each other? These are all question Darby sets out to answer in this third volume of the Blood Series. Josh Brenner is a good looking guy with an extraordinary talent he thinks is a curse - He's telepathic and he can't find the mute button, so he lives in solitude only coming out at night. But Josh isn't the only supernatural out and about this cold March night, because when Josh returns from his midnight run to the store to avoid people, he runs smack into a hungry agitated vampire looking for something and Josh is in his way. Horrified by what he's seen and barely escaping with his life, he confides in a woman he barely knows, but has an instant connection with. When another vampire shows up looking for the first, Josh and his friend Lanie find themselves running for their lives and head to Oljone, California where a friend of Lanie's from College has helped her with a supernatural problem in the past. But when they get to California with the vampire hot on their trail, they find Darby, Lanie's college pal, has moved to Massachusetts in search of her vampire boyfriend Devon. Luckily Darby's sister Rowan and Devon's vampire brother, Blake, step in and help Josh and Lanie as best they can. The four work together along with Dean (a werewolf) and his girlfriend Sally (a witch) to figure out this crazy mystery. What does this determined vampire want and why? And is he willing to kill for it? As this mystery unfolds, so do other darker mysteries. Will they figure things out in time before some is killed? You'll just have to read it to see! As the dust settles from the destruction of the Bloodstone Heart, a small scroll that had been hidden in the hearth of the altar room for hundreds of years, reveals a prophecy that seems to be about the Larsen family. While the group tries to unravel the riddles of the prophecy they also start to notice they've acquired some interesting new powers from the Bloodstone itself, some of which are going to take some getting use to. Darby and Devon head to Ireland to set up house and get ready for their impending nuptials when Darby is asked to help cure the Summer Queen of the Everworld or the delicate balance of power between the Seelie and Unseelie courts will topple throwing the planet into a deadly ice age. While at home, things take a turn for the worse when there's a tragic airplane crash, the Larsen vampires start dropping like flies, Bernard goes missing, and all the bad deeds dealt seem to point towards one person - the Dark Angel. What's so important about the altar room? Why are people dying in the name of this prophecy? Will the Larsen's survive these new tragedies? These questions and other deep seated secrets will be revealed in this final installment of the Blood Series. Phoebe MacIntire, who is a servant to her father and sisters in her own house in Scotland in 1857, is an ordinary girl, with no big dreams for the future. She's perfectly happy in her humble life, with her cot in the basement and her little garden in the backyard. But when her father up and sends her to Newfoundland to be the lifelong servant to Lord Jacobs, she finds her life gets turned upside down. Her journey across the Atlantic to her new home is long, scary and very unpleasant. When she arrives at the manor on a small island, she finds the beautiful place abandoned and only a note waits for her explaining her duties, the strange dietary requirements, and sleeping habits of her new master. The very first night in her new home she's haunted in her dreams by a woman who clearly does not want her there and a strange blue-eyed man-wolf creature that follows the woman. Her dreams become more and more violent and mysteries start to be uncovered about a woman who was killed in a fire on the island, a creature that preys on anyone that comes to the island and a love story gone wrong that dates back over a hundred and twenty two years. Join Phoebe as she explores the past, delving into witchcraft, and vampirism to help a brother save another from a life of sadness and misconception, making some amazing and surprising friends along the way.